Preheat oven to 450. Heat oil in a large, oven safe saucepan. Pour the flour on a large plate and sprinkle with, sage, paprika, salt and pepper. Dredge the chicken pieces in the flour. Over low heat, lightly brown chicken, working in batches if necessary. Drain the fat from the pan and return the chicken to it. Arrange onion slices over the chicken. 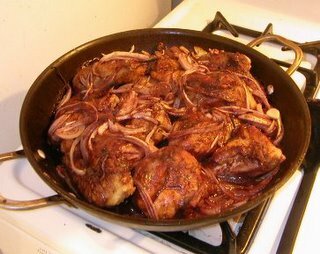 Pour the red wine over the chicken and onions. Place the pan in the oven. Bake appreciated 30 minutes, basting the meat with the wine every 5 minutes. Remove from oven and after checking for doneness, serve. Excellent with a side of white rice. My husband made this for me last night. It's a variation on the dish he often had as a child. It's very homey but the wine makes it feel a little fancier than other baked chicken dishes.